The Cimarron condos for sale sit surrounded by a big green lawn, across Park Avenue from the Riverwalk, the Breckenridge performing arts center. Its exterior is natural wood, with clean exterior lines, and was ahead of its time in 1983 when it was built. There are common entrances and access to all condos is from a common hallway, so there’s no exterior maintenance demands on the homeowners. Each unit does have some outside space – a deck or patio - with full-length sliding doors leading onto them from the living area. The building is two floors plus a lower-level parking garage, all served by elevators. All are two-bedroom units, but there are two sizes, each with open floorplans and a deck. Learn more about the central location of the complex, or browse the updated Cimarron condominium listings found below. Located on the bus route, residents have free transportation to any of the ski resorts in the county, and a quick shuttle to any of the Breckenridge peaks. You can return from skiing or biking on the mountain via four O’clock Run, which is just a block north. This run is kept snow covered in winter, and is a trail to the national forest in the summer. Walk across the street to the Riverwalk from Cimarron Condos, and from there, the central block of Main Street and its restaurants and shopping is just a block farther. 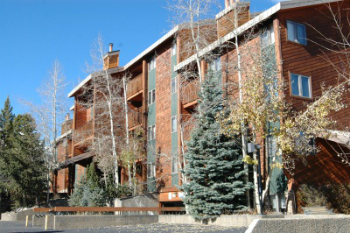 The views from Cimarron Condo will vary by floor but are generally to the east toward Baldy and Red mountains. Since they are located at the bottom of the ski slope side of the valley, they get early morning sun. 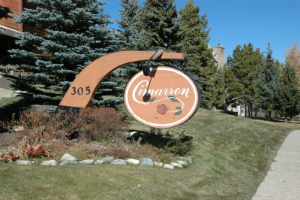 Located on Park Avenue makes Cimarron an easy location to drive to, whether one is coming from the north or south. Size: (2 at 675sq. ft. that are employee or management units) 1202-1138 sq. ft.
From the traffic circle on the north side of Breckenridge take the Park Avenue exit and continue past Ski Hill, and then 4 O’clock roads. Turn right into the Cimarron parking area before reaching Village Rd. From the south, on Highway 9, pass Village. Cimarron is on the left, before Four O’Clock Road. Do you have any questions about Breckenridge, CO real estate? Contact us today to speak with an expert.